Rebecca Johnson loves flowers! So much so that she’s dedicated her life to learning all she can about different varieties from all over the world. Her passion led her to Dover, NH where she opened her first shop in September 2014 – The Flower Room – smack dab in the heart of city center. 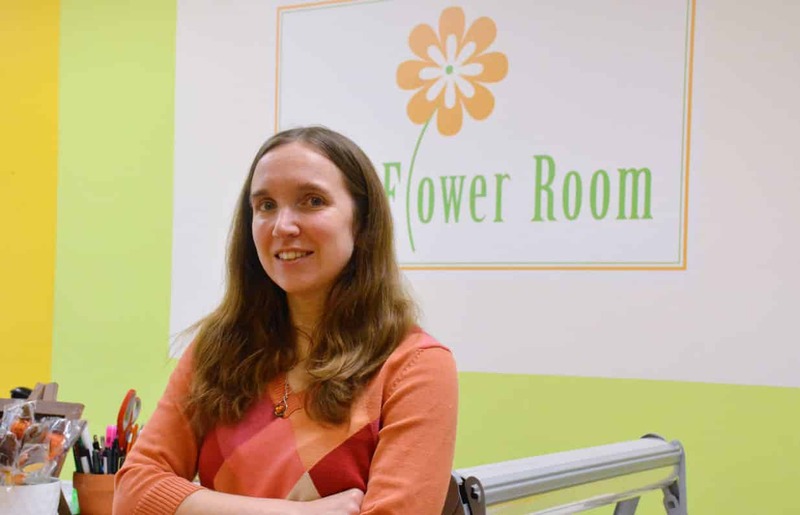 With vibrant yellow walls and an ever present colorful display of seasonal blooms, The Flower Room prides itself on being fully committed to the Dover community and its growth. Rebecca is a member of many local organizations including the Dover Chamber of Commerce, The Chamber Education Committee, and Rotary Club. Rebecca and her team create one of a kind displays for all types of events including weddings, holidays, showers, and corporate events. You can find her in The Flower Room Monday – Friday from 9am – 6pm and on Saturday from 10am – 3pm. * “Fill The Tardis” (Mid November to Christmas) We are building a tardis to have in the store during the holiday season. The idea is to encourage customers to use it as a drop off for the local food pantry (partnered with Dover Main Street) and to take the opportunity to take their picture with it. We’ll have Dr. Who merchandise in the store to purchase as well. * We’re Open Thanksgiving Day 8:30 – 12:30! Bring the Host/Hostess a gift of flowers or local chocolates. * Plaid Friday! We’re Open 7:30am – 6:00pm $5 in Flower Dollars to be spent in January for every $25 spent in-store on Plaid Friday. See store for details. * We are a Plaid Friday Information Headquarters. We’ll have information available about Plaid Friday and the stores that are participating.